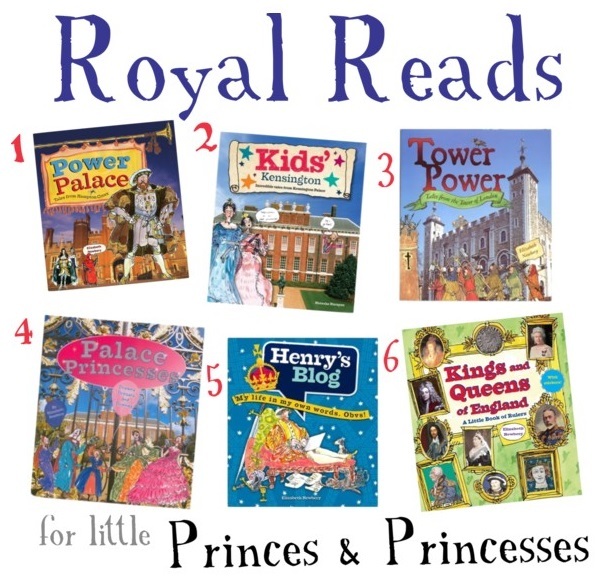 Royal Reads for Kids — Part I. As an aunt of five little ones–plus two more on the way!–I always love giving them books as gifts (obviously making me the ‘cool’ aunt. 😉 ). 1. Power Palace – In the same series as the award-winning Tower Power, this colourful and lively look at Hampton Court Palace through the ages will delight young history fans (and convert those who didn’t think they were!). 2. Kids’ Kensington – Incredible tales from Kensington Palace by Natasha Narayan takes a light-hearted look at Kensington’s history. This lively, fun-filled guide, aimed at 7-9 year-olds reveals the stories of some of Kensington’s more colourful characters including grumpy kings, clever queens, naughty princesses, savage beasts, wild boys and ferocious rat-killers! 3. Tower Power – Who built the Tower of London and why? Was it ever attacked? Which kings and queens stayed there? What happened to the prisoners who were kept there? What’s it like now? Discover the answers for yourself in this delightful children’s book packed full of fascinating stories and amusing illustrations. 4. Palace Princesses – This unashamedly pink book is a fascinating collection of feisty young royals connected with the five historic palaces, from the 12th century Princess Matilda (went to war with her cousin) to 21st century Princess Beatrice (goes to night clubs with her sister). In between, the stories of beautiful, brave, wicked, weak, stupid, stylish, gifted, greedy and sometimes very unhappy princesses will appeal to 9 to 11 year-olds curious to discover more about the lives of real princesses at our palaces. 5. Henry’s Blog – ‘Battles and Boys Toys’, ‘My fit new queen’ and ‘ I marry a teenager’. These are just some of the entries in King Henry VIII’s personal blog as Tudor technology might have created it! Henry’s secret thoughts on ruling, fighting, cute babes and all round global fabulousness are revealed in royal blog-speak, via his online diary. Note: While this round of royal reads has to do with British royalty, I am currently looking for more books to feature the other reigning royals of Europe. Also: any suggestions you’d add to a post? I’d love to feature them! Comment below or feel free to email me at royallyspeakingblog@gmail.com. My students love “How they Croaked” … not sure how old your little ones are but this book gets even the most reluctant reader… reading. Great–Will be sure to check it out! Thanks so much!